Students are guided step-by-step in building their understanding and capabilities to ultimately create electronic projects in teams requiring design thinking. We are based in Sydney and work throughout Australia. We use littleBits, Strawbees and MakeDo to stretch children's creativity and understanding in STEM. The program culminates in a mini science expo where students demonstrate their skills and knowledge. * The program can be tailored to suit your timetable and budget. * The projects can be tailored to cover your preference of topics, subjects or themes. 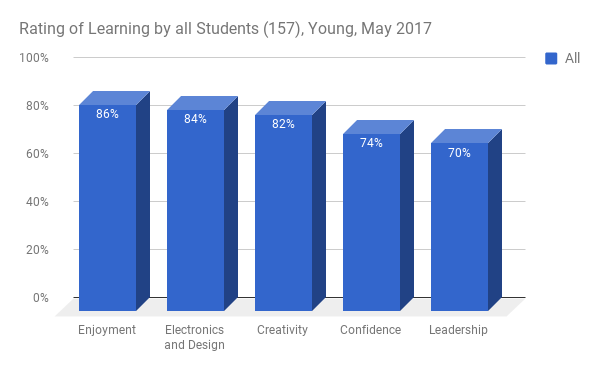 A survey of students at Young Public School, Young North Public School and Young High School rated BrainChild very highly for enjoyment and learning. And between 70-82% for creativity, confidence and leadership building skills which have been identified as critical to developing innovation in young children by NESTA Research Report, 2009.